Are you up for a filling salad that easily stands in as a main course to kick start your new year? I’ve got you covered. Kale is massaged in a dijon maple vinaigrette to tenderize the leaves. 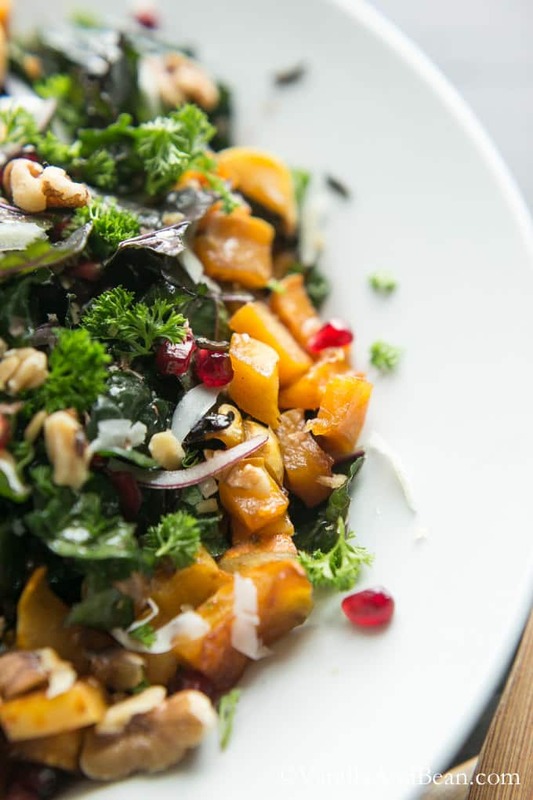 Then the slow roasted squash is added to the kale along with wild rice, pomegranate arils, purple onion, optional pecorino and toasty walnuts. It is filling, nutritious and satisfying. I’m not one to make new year’s resolutions. Instead, I tend to set new goals and reflect on the previous year considering accomplishments and things I wanted to accomplish, yet for one reason or another, didn’t. One accomplishment I feel good about in 2014 is having started Vanilla And Bean. It’s not something I take lightly simply because I’d been thinking about it for several years prior to deciding on a name, hiring a logo designer, choosing my theme, changing my theme and thinking about my content with a million wonderings in between. At several points prior to starting this blog, I suffered from, as my Ma would say, analysis paralysis. Luckily I’ve moved beyond that. And I’m so happy to have taken the leap. My cooking has improved, I’ve worked with unfamiliar ingredients and best of all, I’ve met some fabulous people along the way! I’m constantly reminded of how the Internet connects people in ways I never imagined! There are so many places I want to take Vanilla And Bean, so much to share with you. Now that I’ve learned how to manage most of the technical aspects of running a blog, social media and figuring out what ISO and aperture is, I’m feeling good about moving into 2015 confident and focusing more on content rather than the techy stuff (oh this is a been a learning curve). So with the start of the new year, I need your help. 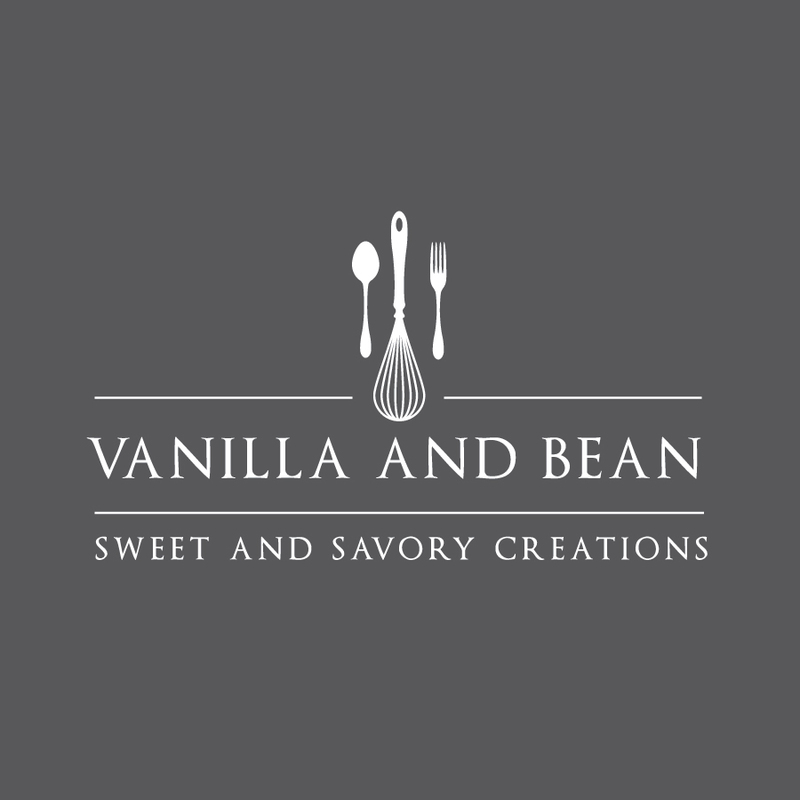 I want to know what you would like to see from Vanilla And Bean in 2015; more of, less of. How can I help? What has been helpful to you? Please leave me a comment below or if you’d rather email me, please do so here or at traci(at)vanillaandbean(dot)com. I value your opinion and look forward to hearing from you! Thank you for reading, following, for your encouragement and enthusiasm about good food! I’m so grateful we’re sharing this journey together. Wishing y’all a delicious and abundant 2015! While the oven is preheating, place the walnuts in a shallow baking dish and toast for about 10 minutes, or until the nuts are toasty and fragrant. Cool, rough chop and set aside. Bring the water and salt to a boil. Drop in the wild rice, stir, cover and reduce heat to low. Cook for about 50-55 minutes until rice is tender. Remove from heat and let stand, covered for 10 minutes. Remove lid and place in fridge. While the rice is cooking, trim ends of squash using a large chef knife. Cut lengthwise in 1/2 and remove and discard seeds. The skin stays on for this squash as it tenderizes as it cooks (it has a nice texture). Cut squash into 1/2 moon shapes at about 1/4"-1/2" thickness (be consistent in how thick you cut so that they roast up evenly). Use a spoon to smooth the scooped out edges. Dice the remaining pieces that are not 1/2 moon shapes into cubes about the same thickness as the moon shapes. Place in a bowl and sprinkle the coconut oil, brown sugar, maple syrup and ground nutmeg over the squash. Toss with hands. Place on a parchment or silpat lined sheet pan making sure each piece is flat and roast in oven for about 25 minutes turning squash about 1/2 way through cooking. Roast until slightly caramelized. Remove from oven and cool. Destem the kale. Ribbon the leaves and then cut into 1"-2" pieces. (This is the point where I wash the kale in a salad spinner). Place in a large bowl. Make the dressing: In a small bowl, add the olive oil, mustard, apple cider vinegar, maple syrup and pinch of salt. Whisk well until an emulsion is formed. Pour 3 Tbs of dressing over the kale. 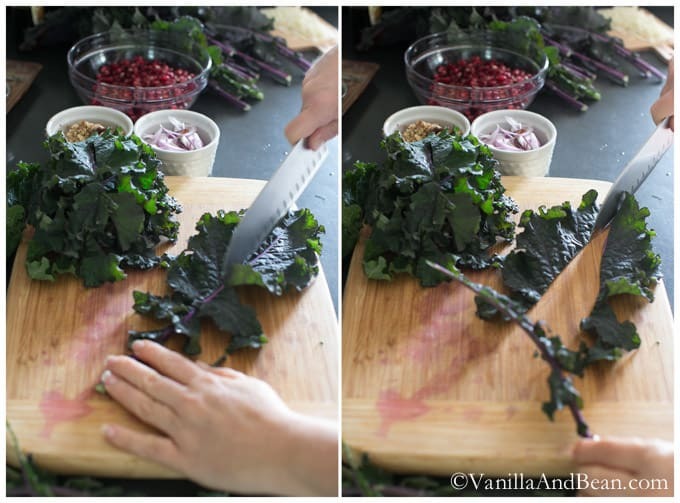 Set a timer for two minutes and using your hands, massage the dressing into the kale. Kale is tough, so don't worry about bruising the kale, just go for it! The leaves will be nice and tender after massaging. 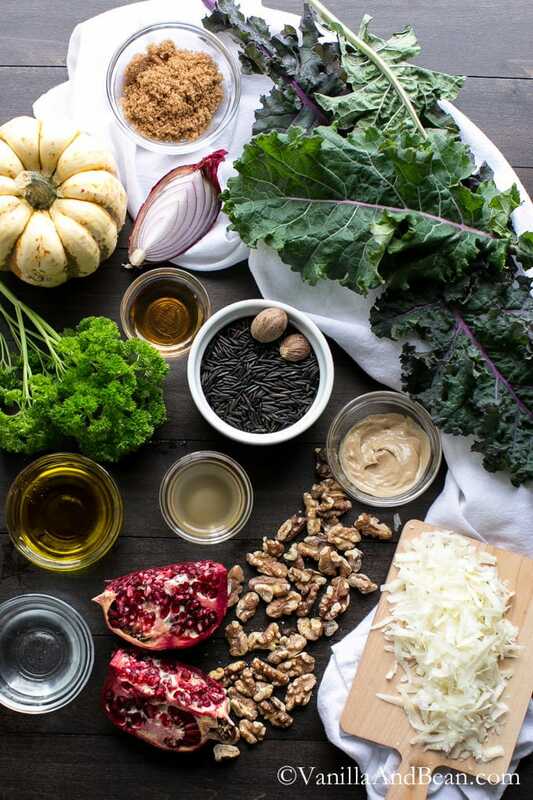 Toss the kale with the cooled wild rice, walnuts, onion, pomegranate arils, parsley and optional pecorino then lay the cooled squash over the top of the salads. Pour the remaining dressing over salad or to taste. Serve cold with a few grinds of pepper. This salad holds up well in the fridge for a few days. 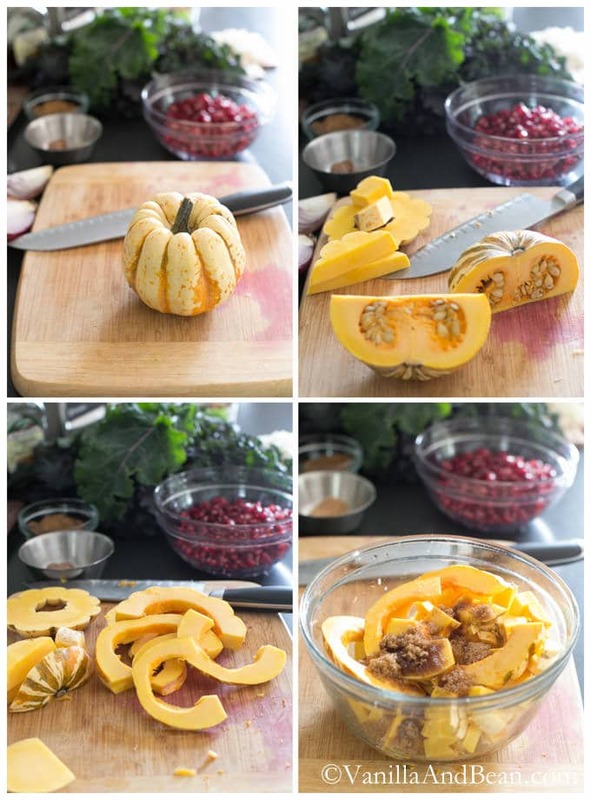 If serving the day after it's made, keep the squash in a separate covered container and assemble when ready to serve. If you make this recipe, or any others on Vanilla And Bean, be sure to post it to Instagram, notify me @vanillaandbean and tag #vanillaandbean! I’d love to see what you’ve made! Also, if you like my content, please consider sharing it with three friends and/or family and follow me on Instagram, Pinterest, Facebook and/or Twitter. Thank you! Oh and before I forget: I’m simply in love with this stunning salad! Such a stunning salad!! I love all of the different elements you added! I am a sucker for any salad with lots of different flavors and textures! What a truly stunning recipe! This year, I would really like more of the same from you, as boring as that sounds. I think you do wonderful work, and I especially like your healthy, savory bowls/salads like this. Can’t wait to try this! Looks and sounds amazing! Congrats on starting your blog this year – it looks like you’ve already come so far with it. I’m glad I stumbled upon it today! Happy New Year to you, Josefine! :D You are welcome! Beautiful site, and so many good recipes to try! This one looks fantastic, and I have a squash waiting to be turned into something healthy and delicious! Gorgeous! Traci, this salad looks divine! While I have been a big kale fan for a while now, most of it was consumed in smoothie form. :) I started to FINALLY be a big girl and eat it raw in salads, and I am a bit ashamed that it has taken me so long to discover it’s rich goodness in a non-bended form! So this salad is high on my list to try as I also just bought a big ol’ bag of wild rice and have a huge butternut squash staring me down on my counter. As far as your blog goes, I cannot believe Vanilla and Bean is just a year old! It is such a beautiful site and full of so many drool-worthy veggie recipes! I re-vamped my blog this year too, after months and months of “analysis-paralysis” – so I understand how exciting yet mind-blogging the process can be. I definitely have a few gray hairs to show for it. :) Haha but your site and your recipes inspire me so much, so all I ask is that you keep up the fabulous work in 2015! Good for you and your discovery of kale outside of the blender! I hope you wrangled that butternut squash and whipped that wild rice into shape… sounds like an old western movie going on here! :D Congrats on your revamping! It’s lovely! Looking forward to discovering more from your beautiful blog as well, Anne! Gosh – I love this salad so much, I pinned it twice! Once for salads and again for food styling! You are an inspiration, Traci! It blows my mind that this is your first year blogging! All I can say is keep doing what you’re doing, my friend. It works!! Oh my gosh. My mom says “analysis = paralysis” to me all the time. That is so me!! Love love love this beautiful, colorful salad. Looking forward to lots of delicious things in 2015! 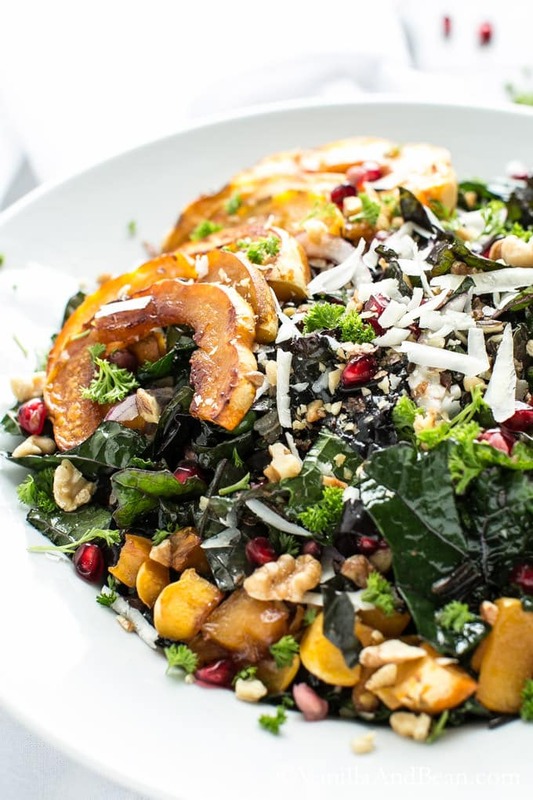 You’ve got all my favorite things in one place: kale, whole grains, squash, poms…. YES! I’ve made kale salad 5 times in the last two weeks. It’s just perfect in every which way. Happy New Year, Tracy! XO! Yeah, one can never go wrong with kale and I love how versatile it is! This salad looks so amazing, Traci! Roasted squash is my favourite and I love the maple flavour added! Bookmarking to try, thanks for sharing! Maple syrup and squash are a perfect pair! It really balances this salad and adds to its earthy notes. Thanks for bookmarking! I hope you enjoy it! 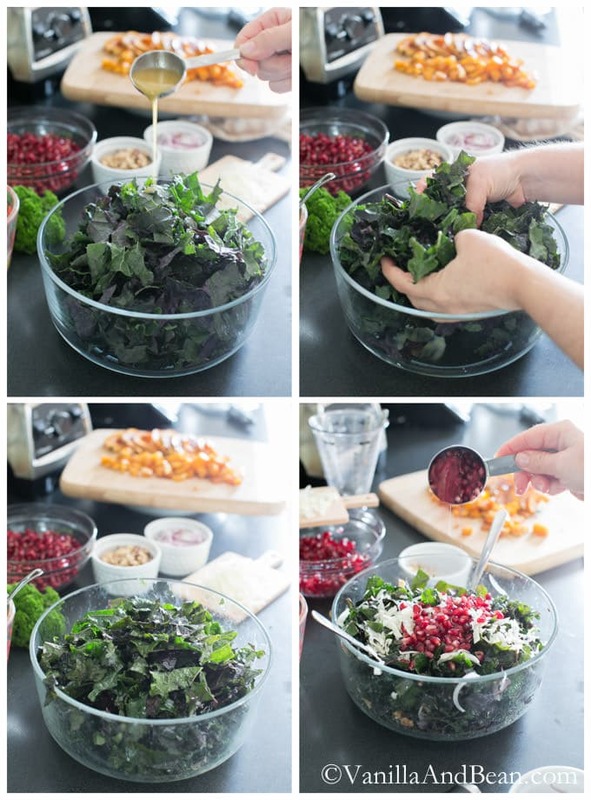 This salad sounds incredible and I love the use of kale in a hearty winter salad. Wishing you a prosperous 2015! Thank you, Jolena! Happy New Year to you too! It takes a very special salad to make my tastebuds salivate.. but this salad has definitely managed to do that Traci! I am just loving all the fresh ingredients and flavours in it, especially that dijon dressing! So glad to be able to help in the salivatory department! hehe! That maple dijon dressing is so versatile; I enjoy it on all kinds of salads! Happy New Year Traci! As always, your pictures are beautiful! This salad looks so freeking good. I know exactly what you mean about the technical learning curve! Im so glad that we are at the same point as well, being able to focus more on content than fixing things. Its a lot of work when you have to learn how to do every little thing that you want to fix! Im sure 2015 will be a great year for you and your blog. Especially if you keep posting recipes that make me drool! This is so gorgeous, Traci!!! I can’t believe Vanilla and Bean is so new! You are an experienced pro! 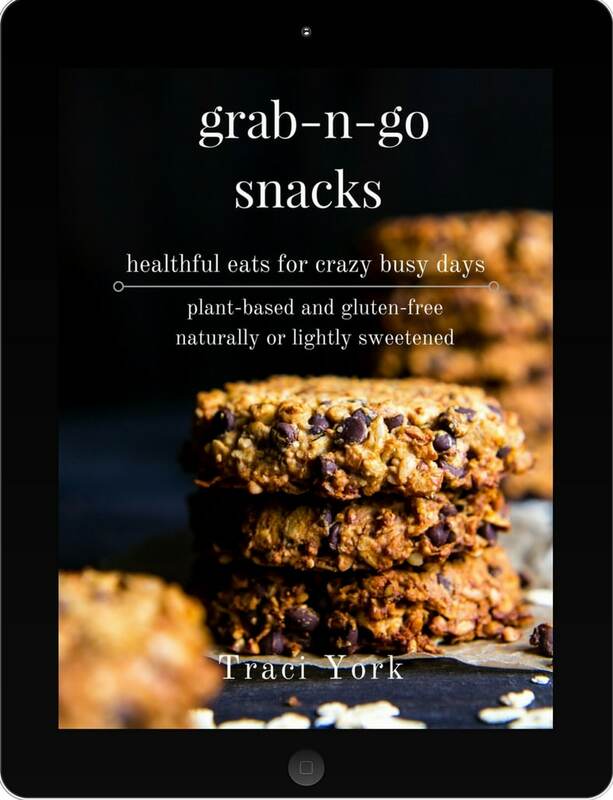 Just more of what you love to eat, photographed the beautiful Traci way, with your delightful writing. Yup, i’ll be a happy follower! ps did you see my little kale massaging trick on insta? I use the stand mixer. Works great! I like to warm the bowl with the dressing just a bit first for a better wilt. Yup.. V&B is a baby! Thanks so much Deb! I basically love everything you do (including this salad!) so whatever you come up with in 2015 will surely make me drool! LOL! Drooling… your site too!! :D Thank you for your feedback! WOW!! This looks amazing!! So healthy and delicious! Great recipe!! I have an acorn squash that I need to make!! :) Love your blog btw!! So pretty!! Happy 2015! Awh, thank you Cailee! I’m looking forward to poking around your site! Thanks for stopping by! :D This recipe would be delightful with acorn squash too! Thanks for your pin Christina and for stopping by! I hope you enjoy the recipe! Happy New Year Traci! This kale salad looks amazing! You’ve used some of my favorite stuff! 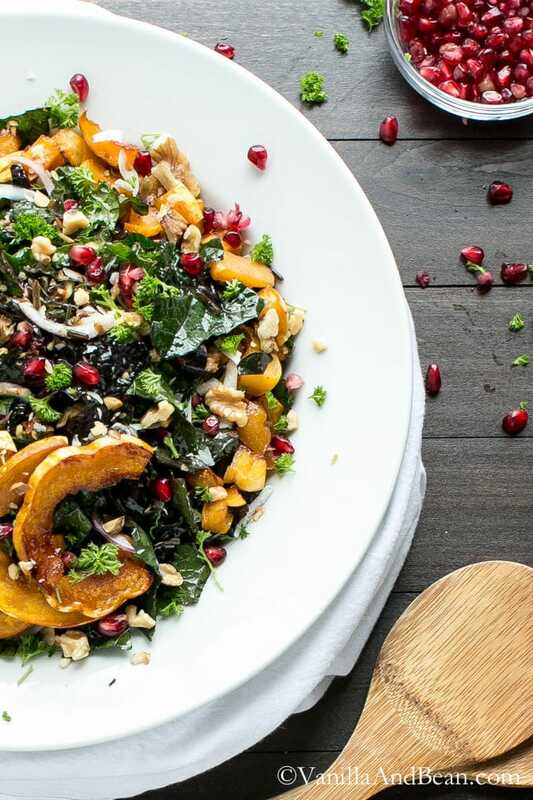 Love pomegranate, walnuts and wild rice and will definitely try it! Great, colorful pictures as always! Your blog is one of my favorite ones and I enjoy your healthy recipes, because they are close to what I like! I would love to see more colorful dishes like this salad, but I also like your cookies and baked goods! Happy New Years! I foresee many great things for Vanilla and Bean in 2015! Thank you, Julia! Oh yeah, that maple syrup in dressings is lovely! I especially love it with balsamic vinegar; have you tried it? Ahh, Traci, this is just the perfect kind of salad. It’s healthy, flavorful and gorgeous!! 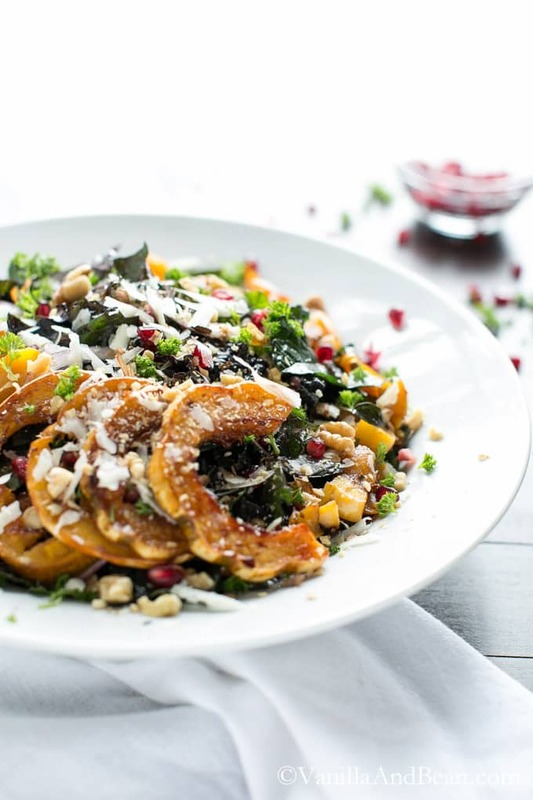 Roasted squash works so well in a salad. Love the addition of pomegranate, wild rice and nuts, too. I could just eat this whole bowl by myself :). Your blog is one of my absolute favorite to read. Your recipes are always inspiring and creative, the photos beautiful and the photo tutorial/steps are really helpful. So I wouldn’t change anything if I was you – just keep serving up these delicious recipes each week! All the best to you in 2015! I know how you like a good salad, Geraldine! Your recipes always inspire me too… I know you’ll enjoy this one! I admire your diving right in to blogging… I can’t dwell on my analysis paralysis prior to V&B or it will drive me mad!! My blogOverseray will be coming sooner than later. It’s hard to believe it’s been almost a year… really. So glad to have found SLF and being able to get to know you has been lovely, Izzy. So here’s to 2015 (and cats)!